Journal of the House of Lords: Volume 8, 1645-1647. Originally published by His Majesty's Stationery Office, London, 1767-1830. DIE Saturni, 18 die Aprilis. Message from the H. C. with Orders, &c.
Order concerning Mr. Rous's Version of the Psalms. E. of Lincoln versus E. of Northampton. Bransby to command The Hunter. and to expedite the Excise Ordinance. and the Order for the Oxford Committee. Vote of the H. C. about Scotch Papers, reflecting on the Parliament. Message to them, with it amended. Order, That no Horses be exported for Three Months. No Pass to be granted to Persons to go beyond the Sea, who are in Places besieged. Order to free Mr. Murray's Estate from Sequestration. Order for 50£. to Mr. Fogg, from Ruthin. Order for 50£. to Norton, from the Army. Order for 100£. for Potter, from Exeter. Order for 4000£. to be advanced for the Scots Officers. A Message was brought from the House of Commons, by Mr. Knightly, &c.
1. An Order, That no Pass for Horses or Geldings shall be transported beyond the Seas for Three Months. 7. An Order for Lieutenant Colonel Thomas Mason to be Governor of Ruthyn Castle. 9. 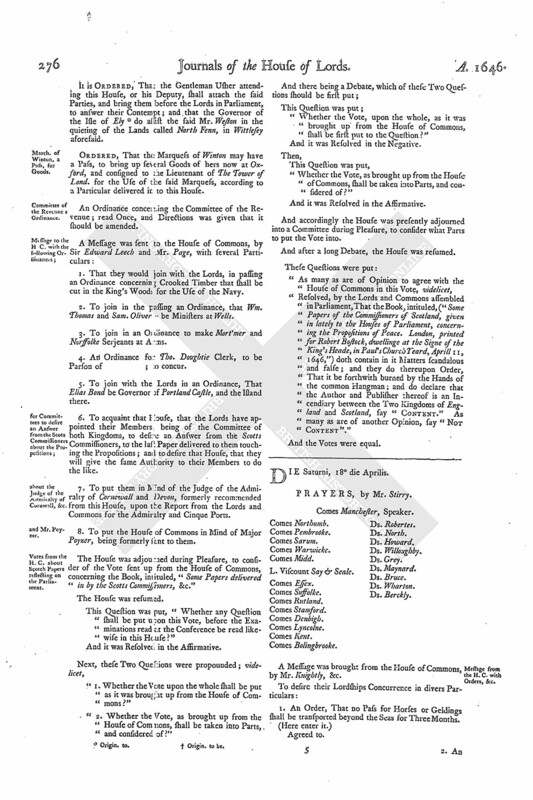 An Order for the using of the Book of Psalms set forth by Mr. Rous, and appointed by the Assembly of Divines. 10. An Order concerning Committees not to judge of Matters that are between Party and Party. Read Twice, and committed to the Committee of the whole House; to be taken into Consideration on Wednesday Morning next. That to the Order (fn. 1) for using the Book of Psalms translated by Mr. Rous, and to the Order to prohibit Committees from meddling with Private Business, and to the Order concerning the Governor of Ruthin Castle, their Lordships will send an Answer by Messengers of their own: To all the rest, this House agrees to them. Ordered, That the Earl of Midd. is added to the Committee for Privileges. Upon reading the Petition of the Earl of Lyncolne; shewing, "That the Earl of North'ton stands bound to him, by Bond of Four Thousand Pounds, to pay Two Thousand Pounds Principal, due the 9th May last, and for which his Lordship stands in Truth intrusted as a Friend for Sir Arthur Gorge's Children; and the said Earl of North'ton being now to go beyond Sea, the Debt will be in Danger, unless some Relief be herein from this House: Therefore his Lordship's Desire is, That, before the Earl of North'ton be admitted to pass beyond Sea, he may take Order, either to satisfy or secure out of his Land the said Debt; and that the Arrears of Interest-money may be presently paid for the said Childrens Maintenance." Hereupon it is Ordered, That the Earl of North'ton shall have a Copy of this Petition, and desired to return his Answer thereto by Wednesday next. "Die Jovis, 16 April. 1646. "Whereas this Committee hath thought fit, upon Advice with some of the Committee of the Navy, that a small Prize, of about Thirty Tuns, lately called The Cole Dogger, and now The Hunter, should be added unto the Fleet now prepared for this Summer's Expedition, she being a serviceable Vessel, and of small Charge, and is accordingly fitted for the Service: This Committee doth recommend it to both Houses of Parliament, that Joseph Bransby (who hath been formerly employed in the Parliament's Service, and suffered much by his Imprisonment at Castle Cornett belonging to the Island of Guernsey) may be by them approved of for Command of the said Vessel during this Summer's Expedition." Ordered, That this House approves of this Report; and that it be sent to the House of Commons, for their Concurrence. To desire their Lordships Concurrence in an Order for adding some Names to the Committee for Oxon. Agreed to, with the adding of Mr. Watson. 2. To desire their Lordships to expedite the Ordinance for the Excise, which depends in this House. Ordered, To be taken into Consideration on Monday Morning, by the Committee of the whole House. That this House will take these Particulars into Consideration, and send an Answer by Messengers of their own. To desire their Concurrence in the Report this Day made, concerning Joseph Bransby. 2. To put them in Mind of the Petition of the Singing Men of Chichester. 3. To let them know, that this House agrees to the Order for adding the Persons to the Committee for the County of Oxon, with the Addition of Mr. Watson. Next, the House took into Consideration the Vote which was brought from the House of Commons, concerning the Book, intituled, "Some Papers of the Commissioners of Scotland." The Question was put, "Whether to pass the Vote which came from the House of Commons, with these Alterations and Amendments now read?" To let them know, that this House hath passed the Vote which came from them, with these Alterations and Amendments; wherein their Concurrence is desired. "Ordered, by the Lords and Commons assembled in Parliament, That from this Day no Pass be granted, by both or either House of Parliament, for the Space of Three Months, for any Horse, Mare, or Gelding, to be transported from any Port in this Kingdom into any the Parts beyond the Seas." "Ordered, by the Lords and Commons assembled in Parliament, That no Pass be granted, by either House, to any Person, to go beyond the Seas, that is in Oxford, or in any other of the King's Garrisons that is besieged or streightened, whilst it is so besieged or streightened." 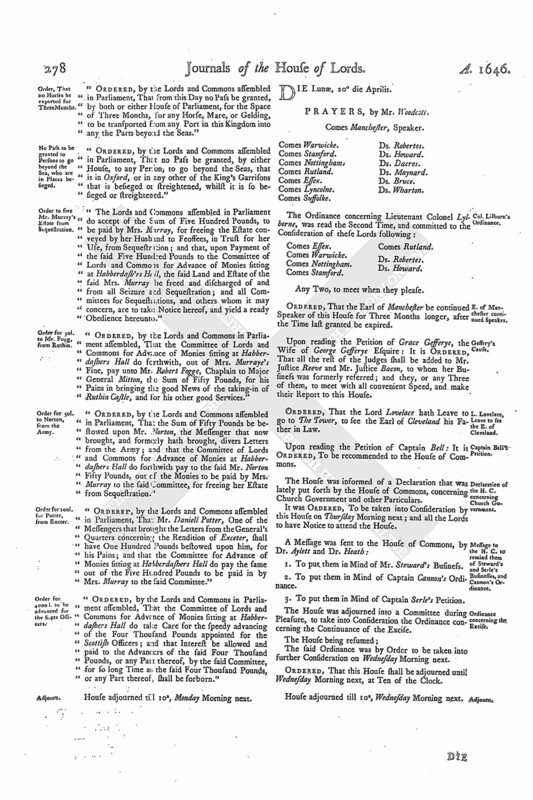 "The Lords and Commons assembled in Parliament do accept of the Sum of Five Hundred Pounds, to be paid by Mrs. Murray, for freeing the Estate conveyed by her Husband to Feoffees, in Trust for her Use, from Sequestration; and that, upon Payment of the said Five Hundred Pounds to the Committee of Lords and Commons for Advance of Monies sitting at Habberdash'rs Hall, the said Land and Estate of the said Mrs. Murray be freed and discharged of and from all Seizure and Sequestration; and all Committees for Sequestrations, and others whom it may concern, are to take Notice hereof, and yield a ready Obedience hereunto." 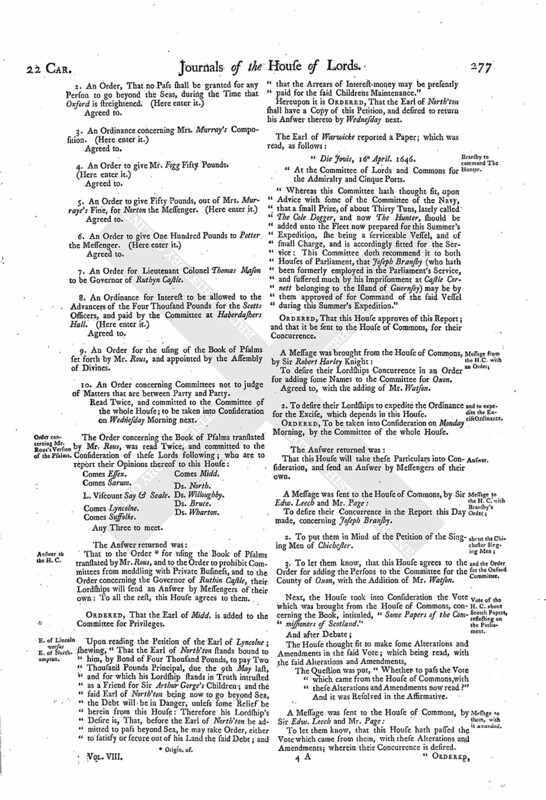 "Ordered, by the Lords and Commons in Parliament assembled, That the Committee of Lords and Commons for Advance of Monies sitting at Habberdashers Hall do forthwith, out of Mrs. Murraye's Fine, pay unto Mr. Robert Fogge, Chaplain to Major General Mitton, the Sum of Fifty Pounds, for his Pains in bringing the good News of the taking-in of Ruthin Castle, and for his other good Services." "Ordered, by the Lords and Commons assembled in Parliament, That the Sum of Fifty Pounds be bestowed upon Mr. Norton, the Messenger that now brought, and formerly hath brought, divers Letters from the Army; and that the Committee of Lords and Commons for Advance of Monies at Habberdashers Hall do forthwith pay to the said Mr. Norton Fifty Pounds, out of the Monies to be paid by Mrs. Murray to the said Committee, for freeing her Estate from Sequestration." "Ordered, by the Lords and Commons assembled in Parliament, That Mr. Daniell Potter, One of the Messengers that brought the Letters from the General's Quarters concerning the Rendition of Exceter, shall have One Hundred Pounds bestowed upon him, for his Pains; and that the Committee for Advance of Monies sitting at Habberdashers Hall do pay the same out of the Five Hundred Pounds to be paid in by Mrs. Murray to the said Committee." "Ordered, by the Lords and Commons in Parliament assembled, That the Committee of Lords and Commons for Advance of Monies sitting at Habberdashers Hall do take Care for the speedy advancing of the Four Thousand Pounds appointed for the Scottish Officers; and that Interest be allowed and paid to the Advancers of the said Four Thousand Pounds, or any Part thereof, by the said Committee, for so long Time as the said Four Thousand Pounds, or any Part thereof, shall be forborn."